The Nolan N21 Vintage Helmet is old made new again, continuing the legacy of the Nolan N20. The VPS sunscreen retracts into the shell, giving it a unique compact look. The streamlined shape of the shell is inspired by the timeless vintage look, while presenting clean and modern lines and functionality. The inner padding has been designed with meticulous attention to detail to offer the light weight expected of a shorty style helmet, together with the close fit and stability of a full-face helmet. Note: The Nolan N21's chin strap is integrated into the neck roll for a smoother fit and a quieter ride. This can make the helmet difficult to put on for riders who struggle with helmets folding their ears. I've had both the Nolan N21 and the LSR Spitfire- there is no comparison in the fit and finish between the two.. the Nolan far exceeds expectations. With that said, everything else is subjective to the person using the helmet, but I'll do my best to give the highs and lows. First, the VPS "Sunscreen" is a false representation. It's not a sunscreen in any way as it's clear. "VPS" stands for Vision Protection System- in other words, it's just a clear shield that keeps the user from needing eye protection. Good news is that Nolan sells replacement VPS shields in three tint levels. I purchased the dark tint- removal instructions come with the helmet (don't throw the manual away guys!!) and it's a tool-less 25 second swap, which couldn't be easier. The ratchet closure works great, however the way it sits, it presses firmly against my adam's apple and makes swallowing uncomfortable. The vents are also functional, but as the manufactures manual states, they are more for aesthetic purposes than actual venting. They basically say if you want a vented helmet, they have others you should have bought. I would agree- a few rides in mid 80's is not unbearable, but you definitely won't compete with any 1/2 helmets for venting capability. Fit is a little tight. I'm between a medium and large, but even the large is just a "smidge" tighter than my preference.... I assume after break in, things will get better. Now for the plus side- again, this helmet is WELL WORTH the extra money over the $100 variety any day of the week. On the LSR I had a lot of wind noise following the line from the edge of the drop down sunscreen and right back to my ear. With the padding in the Nolan, this is eliminated. The neck roll also keeps wind and noise from coming in from the bottom. I also did not notice any buffeting with this that shouldn't be expected- come on guys, this is STILL a 3/4 OPEN helmet... you wouldn't expect a sunroof to replace a convertible, so don't plan to replace for full face with this. With that said, the helmet IS very quiet for an open helmet- most of that I contribute to the padding. **Note, I do have a full fairing motorcycle with a 14" Klockwerks Sport Flair, so wind isn't blasting me all day like someone on a sport bike or cafe bike. I can still clearly hear my radio with just bumping it up a few notches from the level I normally listen to with a half helmet. The dark tinted screen I purchased is accurate and it IS a dark screen- free of any distortion for a wide viewing angle- the same would hold true for the clear screen that comes with the helmet. I also wear glasses and they are not affected by the drop down screen at all. 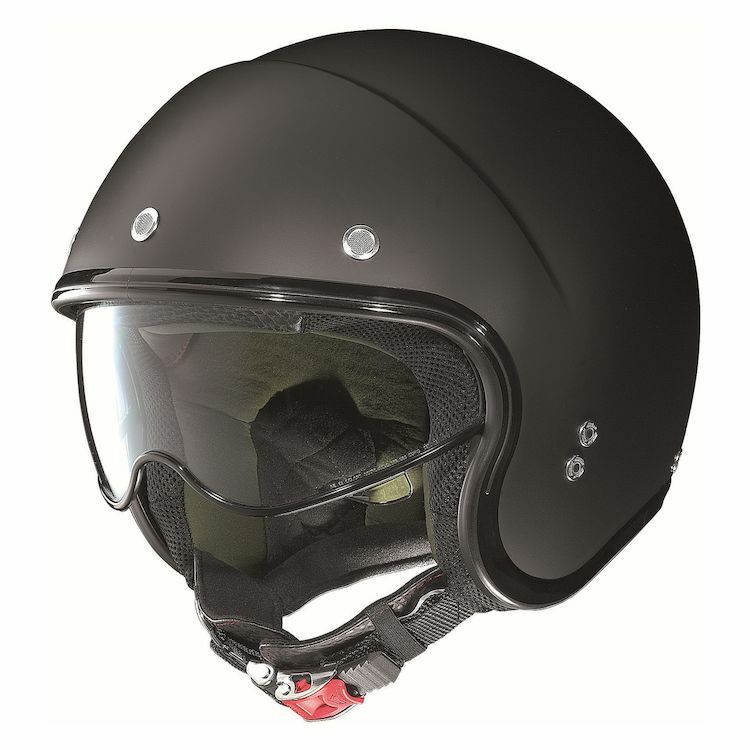 Overall, a very quality helmet with a 5 year warranty. I'll enjoy this one for a long time!!! This helmet meets anyones needs. It would be amazing if it came with a dark and gold visor along with the clear one provided, this would enable riders to choose. Also, this type of helmet is inline with touring in mind, that being said, pre cut ear piece areas in the inner foam portion behind the liner, would certainly be most welcomed. I didn't mind doing my own customizing, but because so many earbuds are similar, pre cut is the way to go. Finally, IT IS MOST COOL! First off it's a great fit, I'm a true "large" and it fits well. The fit and finish of the helmet is fantastic, from the shell to the micro-ratchet fastener. That is....until you get to the drop down visor. It's cumbersome, even a little dorky and buffets quite a bit at speed (50+ mph). I wanted to "LOVE" this helmet, but the visor is a negative for sure...trim it by 25% and I think maye that would help.